Oil on canvas, 45,5 x 58,5 cm. 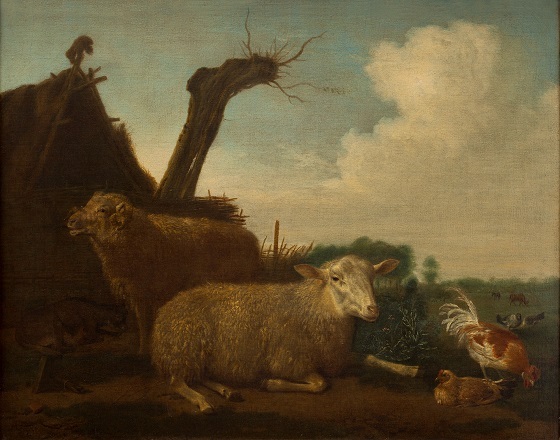 The increased importance that Adrian van de Velde gave to livestock in his landscape paintings demanded an in-depth study of the animals in their natural surroundings. According to the contemporary art historian Arnold Houbraken, the artist therefore went on weekly excursions to study animals and the nature of the Netherlands. In this painting, one can sense Velde’s interest in capturing the distinctive characteristics and movements of different animal species. In front of an enclosure lies a sheep, while a ram brays behind it. There are pigeons and chickens on the right. One of the hens is strutting around looking for food. In the background a black pig can be seen lying by the sheep pen and cattle grazing in the meadow beyond the pigeons and chickens. Adriaen Van de Velde’s plain air studies were a key component in the development of the realistic Dutch landscape style in the mid-1600s.